As the 1950s passed into history, the 1960s roared into life. At the State of Man Congress, L. Ron Hubbard had set the whole of Scientology on course for OT, announcing the breakthrough of Responsibility and the technology of Overts and Withholds. The very next day, he began lecturing auditors on the Hubbard Clearing Scientologist Course: “Today you’re auditing cases and you’re auditing them on the hottest buttons there are in cases and it requires you to be alert and you to be on your toes all the time.” In short, there could be no slightest compromise with perfection and that meant auditing of hairbreadth precision, mandating one auditor tool in particular—the E‑Meter. Here, then, is where Mr. Hubbard provides a consummate description of every facet in metering. Here is how the meter registers the thetan’s effect on matter, energy, space and time, here is the why behind a theta bop, here, too, is recognition of cases by meter reaction. It is all here. L. Ron Hubbard presents the how and why of meter use and meter phenomena to locate and handle overts and withholds, thereby restoring responsibility and thus opening the gates to OT. If the 1950s culminated with a series of breakthroughs to make broad scale clearing a reality, the 1960s were heralded with discoveries pioneering entirely new realms on the route to Operating Thetan. And with the completion of the 1st Melbourne Advanced Clinical Course and the State of Man Congress—embracing all L. Ron Hubbard had discovered bearing on overts, withholds and the pivotal importance of responsibility in the making of OTs—Scientology entered not just upon a new decade, but a new era. Thus, scarcely had 1960 dawned when Mr. Hubbard began delivery of the Hubbard Clearing Scientologist Course in the Academy of the Founding Church in Washington, DC. Those picked to receive this advanced training comprised some 25 top auditors, with the course starting on 4 January. As a first instruction, they listened to the lectures he had given a few weeks previously to the class of the 1st Melbourne ACC, containing the theory, mechanics and application of his most recent discoveries. Simultaneously, he delivered evening lectures embracing the scope of the E-Meter, set forth and demonstrated exhaustively—a truly consummate description of every conceivable meter phenomena, including how to recognize it, what it meant and, most important, how to apply it in session. Energy—why you can burn coal to produce heat and how this relates to auditing. 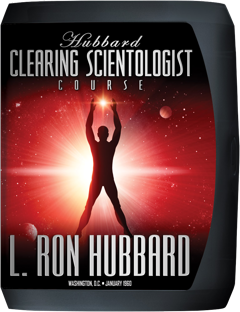 Also included is a recorded message from L. Ron Hubbard of 11 March 1960 containing data directly related to the HCS Course. It was addressed to students of a South African ACC which was comprised of a replay of the HCS and 1st Melbourne ACC lectures. Titled “Special Course Tape—South African ACC,” this recording has never been available and is presented here for the first time.